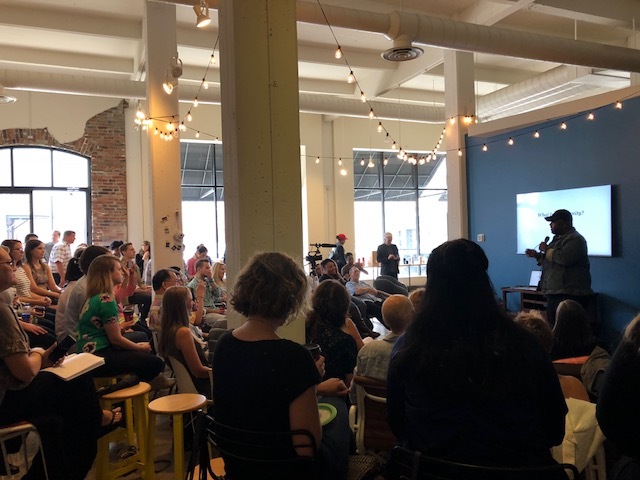 Marshall Shorts was the featured speaker at today's Creative Mornings Columbus held at Hopewell in downtown Columbus. "Community" can mean many different things to people and it's difficult to settle on one definition. My take: It's what unites us. I always promote Creative Mornings to everyone - you don't have to think you're creative to attend...you already are so you should come. Get to the next event, Creative Mornings Columbus' 2nd Anniversary gathering, on September 21 at the Columbus Museum of Art. You'll dig it. It was a full house for Marshall's presentation this morning at Hopewell.